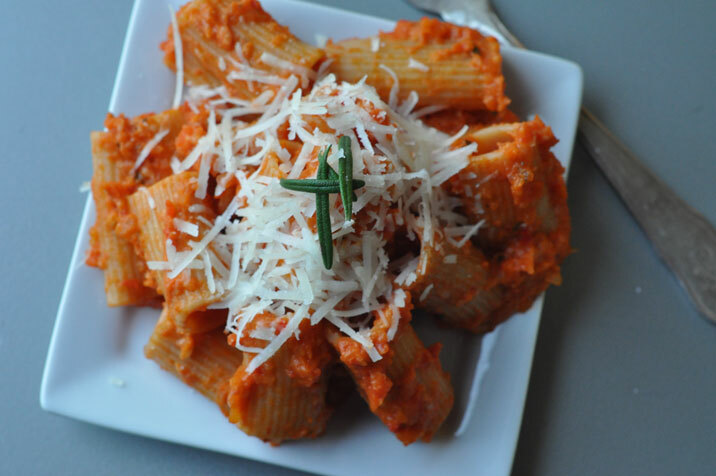 Rigatoni Strascicati – a great way to trick your children into eating their vegetables! Warning! Long travelogue ahead; skip to the bottom if you wish to avoid the travelogue and view the recipe for Rigatoni Strascicati from Trattoria Antico Fattore. Trattoria Antico Fattore is on my Florence restaurant wish list, but unfortunately, we didn’t get there on this visit. On pasta overload from the trip, the day after we got back from Italy, I needed a pasta fix and luckily found this recipe in a Biba Caggiano’s Trattoria Cooking cookbook. Delicious… and, a great way to get your kids to eat their veggies without their knowing! So, this was our first visit to Italy. I didn’t really know what to expect. Of course, in architecture school, the architecture of Florence was a very big deal- especially Brunelleschi’s Duomo. I just really wanted to soak up the art and atmosphere and not overschedule us. Overscheduled tourists in Florence have been know to develop Stendhal Syndrome, but with my schedule we were safe from that malady. So, you’ll see our schedule is very low key & an ambitious family could see a lot more….but alas, architect mom’s family focused more on gelato….we’ll save more museums for future visits. The historic area of Florence is very dense with glorious sights. Walking is very easily done; all of the major sights are within easy walking distance. Cars are not allowed in a big portion of the historic area, so you definitely do not need a car in Florence. Be warned, if you happen to have a puffy afro like Coco be prepared for strangers to touch your hair as they stroll by. Excellent central location; just a stone’s throw from the historic Ponte Vecchio bridge on the Oltarno side. One end of the second floor apartment overlooks the Arno River and the other end faces quaint Borgo San Jacopa. It easily sleeps up to 6 having a master bedroom with a queen sized bed, another bedroom with two twin beds and a queen sized pull-out bed in the living room. It also has two good sized bathrooms and a washer is available in the kitchen. The kitchen is small, but workable; I didn’t want to use it anyways, as I wanted to eat real Italian Food! 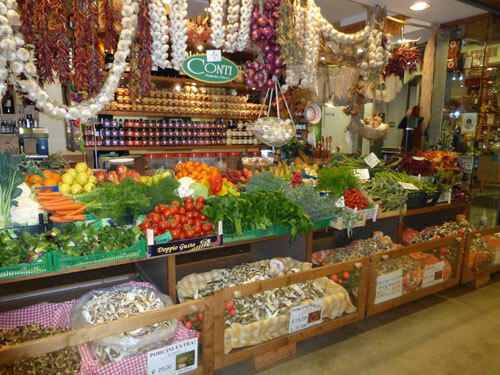 It is surrounded by a plethora of tasty restaurants and a well stocked Sapori and Dintorni Conad supermarket is about a half a block away. The manager Alessandra is very efficient and congenial. Breakfast: Florentines typically have a caffe (coffee) and a roll (brioche or cornetto – croissants to Americans). Tourists like us enjoy cappuccinos, no matter what time of the day. We typically picked up our cornettos and cappuccinos at the O Café around the corner on Via De Bardi, 58,r. Lunch: Lunch can be very fast and casual with a take-out Panini or slice of pizza or more leisurely and expensive by eating at a restaurant. Dinner: Italians typically eat after 8 pm. Traveling with kids, we were typically able to get in restaurants around 7 / 7:30. A full Italian meal consists of several course: antipasto (appetizer), primi piatto (first dish usually pasta, rice or soup), secondo piatto (our main course – meat or fish), contorno (vegetable sides that are typically ordered separately) and then of course, dolci (dessert). That can be a lot of food and a lot of money if you order all the courses per person. Most guidebooks say a good rule of thumb is for each person to order any two courses. We typically did this, but Coco usually only had a pasta dish from the primi piatto menu. Took a taxi from the airport to the apartment. Five people with luggage meant two taxis; the fare for each taxi was 23 Euros. Arrived about 2:30 at the apartment. 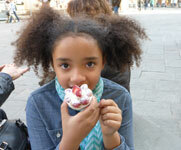 Explored the Oltrarno neighborhood around the apartment and had gelato at Gelateria la Carraia (Piazza Nazario Sauro, 2). Dinner at Trattoria Mamma Gina (Borgo S.Jacopo, 37/r). Gelato at Gelateria Santa Trinita (Piazza Frescobaldi, 11,12/r). 3 hour private Florence Overture tour with Sara from Freya’s Florence Tours (210 Euros) with a stop at the L’Accademia to see Michelangelo’s David. Bellisimo. Coco especially loved this tour. Dinner: Gusto Osteria (Via de ‘Michelozzi, 13 / r). Mixed grilled veggies with brie was divine. The Lieutenant, Miss G. & Mr. D. went on an all day vespa tour in the Tuscan countryside through Florencetown tours. Edoardo il Gelato Biologico organic gelato (Piazza del Duomo 45/R) – gelato! Visited the Florence Cathedral & Museum and huffed and puffed to the top of Brunelleschi’s magnificent Duomo. Lunch at not a good spot…I missed my target restaurant Verrazza by a couple of blocks. Visited the Uffizi, (book online at http://www.b-ticket.com/B-Ticket/uffizi/default.aspx). The Uffizi is Italy’s crown jewel of museums. Our earlier tour guide, Sara, said it was second only the Louvre. We followed Rick Steves’ Uffizi tour advice. You start on the top floor and meander through the medieval and renaissance galleries of the museum’s u-shaped floor plan seeing works by Botticelli, Raphael, Leonardo and Michelangelo to name a few. Before exiting (which in itself is full of masterpieces) we stopped to have a cappacino on the rooftop terrace overlooking the Palazza Vecchio. Life doesn’t get much better than this! Dinner at Tamero Pasta Bar (Piazza Santo Spirito 11r) in San Sprito square. This was the Lieutenant’s favorite meal. The food had a way more modern riff to it than our previous meals in Florence. Here’s a review by the New York Times, http://www.nytimes.com/2013/06/30/travel/restaurant-report-tamero-pasta-bar-in-florence.html?_r=0. The Lieutenant wanted to keep coming back here, but alas, I wanted something different every night for our short stay here. Gelato at Gelateria Santa Trinita. century cathedral, Piazzo del Campo, the Palio horse race, and Nannini pastry shop and San Gimignano, home of the rocca, quaint towers and the best mango sorbet at Gelateria Dondoli (Piazza della Cisterna,4). I would have loved more time exploring Sienna. A good pasta lunch was served between the two towns at a Tuscan wine estate, Fattoria Poggio Alloro. The Lieutenant especially loved the lunch as the lady sitting next to him thought he was Miss G.’s brother. I think she must have had cataracts. The last stop was Pisa, where, of course, the tower is trying to topple over. Dinner close the the apartment at Ristorante Celestino (Piazza di Santa Felicita, 4). We thought the food was good and the service was very welcoming. Review here. Walk to San Miniato Church and Piazzale Michelangelo for a grand view of Florence from this beautiful elevated square. Outdoor scrumptious lunch at Osteria Antica Mescita San Niccolo (via di San Niccolo, 60). Review here. Gelato at Il Gelato di Filo (via San Miniato, 5r). Review here. More exploring the streets and market at Piazza Ciompi. Pizza and Gelato family cooking class at In Tavola. Our favorite was the sweet salami we made. More wonderful gelato at Caffe degli Artigiani Gelateria Della Passera (via Toscanella 15/r). Review here. Wish we had explored the Pitti Palace/ Boboli Garden, but we didn’t. I explored the Sant’Ambrogio market and the streets of Florence. Lunch under the beautifully frescoed vaulted ceilings at Ristorante Paoli (Via dei Travolini, 12/r). Review here. Dinner at Trattoria 4 Leoni (Via de’ Vellutini, 1r). I had fabulous fiocchetti di Pera; little pasta purses filled with three cheeses and pear served in a cream sauce with asparagus. Holy Smokes, I just found a recipe for this exact dish on the Kitchn blog. Thank you Kitchn blog! Review here. Gelato, of course, at gelateria Santa Trinita. Goodbye, Florence. I hope to see you again soon! For more information on restaurants, click here! Heat the oil in a large skillet over medium heat. Add the vegetables, garlic, sage and rosemary and cook for 4-5 minutes until the veggies are lightly golden. Add the tomatoes and cook, uncovered, over low heat for 12-15 minutes. Transfer the sauce to a blender or food processor and blend until smooth. Melt the butter in the same large skillet. Return the tomato sauce to the pan and add the cream. Season with salt and pepper and simmer for 1 to 2 more minutes. If sauce is too thick, thin it with chicken broth or water. While the sauce is cooking, cook the rigatoni in salted water until al dente. Drain. Add the rigatoni to the sauce. Stir in 1/3 cup parmigiano and the basil. Serve with the remaining cheese.